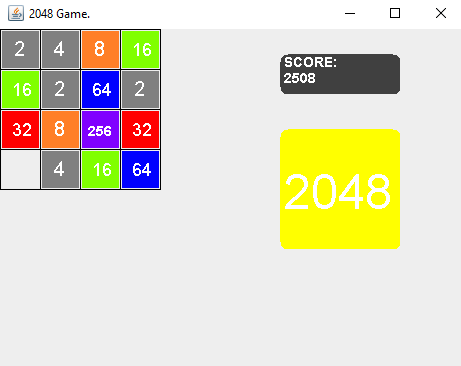 2048 Game in Java Swing. Recently in the Java Forum, I came across a Question about a Game I never heard of, The question was about how to check moves and slide the relevant tiles across in a game of 2048. Never having heard of the game my answer was pretty terrible as I had not fully understood the problem. The game is played in a 4 by 4 grid, and you start the game with two initial tiles these can be 4 or 2 and are picked at random after each move by the user a random 4 or 2 tile will appear in an empty place until no more tiles can be placed or you reach the magical 2048 tile. To get to the 2048 tile you combine tiles of the same value ie 4 can be combined with another 4 to make 8, two 8's make 16, two 16's make 32 all the way up to 2048. The Game was invented by Italian web designer, Gabriele Cirulli over a weekend and got over 4 million hits in a few days it became an internet sensation, even more, puzzling that I had never heard of it. So I played it a couple of times and was fascinated with it and the simple rules to the point I decided to make my own version which took me a day of programming on and off in Java Swing. I am known more in the C and C++ forum so this is actually my first Java Tutorial, my Java is not that great, I'm ok and get by in Java but no more than that, but I feel its time to spread my Java wings as it were. Here is a screenshot of the game we will make. Now the source code is freely available to look at but decided just to make my own version without looking at the original code. So my code may actually be quite verbose. Its really short and just draws a 4by4 Grid on a JPanel. each grid cell is 40 by 40 px. It takes a Matrix object and a scoreBoard object in its constructor, this is to facilitate changes to the game board and the scoreboard. It responds to the four arrow keys calling functions inside of Matrix to update gameplay. Basically just shows the current score, also shows game over or game won signs as appropriate. produces random 4 or 2 on request and the 'timer' is being used as a mechanism to put a flashing or glowing tile effect on the initial tile ie when it is first shown. The checking requirement is more difficult than it first seems in a slide left move, you have to check the columns horizontal neighbors to decide how it moves you have to check them in this order assuming a matrix of 4by4 or 0 to 3 2d arrays. that is we slide in from array position 3 and check against array position 2 first of all then the check is 2,1 then lastly 1,0.
then we check if the values at those array points are equal to each other, if they are great we add them together in the lower column value ie if we are checking 3, 2 then we put it in the answer in column2, if the values are not equal we do nothing. Then we consider the third case if the value of the higher column is not zero but the lower one is, in this case we want to swap the values of the two cells. then we check if the values at those array points are equal to each other, if they are great we add them together in the higher row value ie if we are checking 3, 2 then we put it in the answer in row3, if the values are not equal we do nothing. Then we consider the third case if the value of the lower row is not zero but the higher one is, in this case, we want to swap the values of the two cells. This adds a new JFrame window and a JPanel we set the relative position to null as we want to layer the various JPanels to build our game up we also set opaque to false so we can view the layers we build up. We add a grid some Tiles a scoreBoard and a keyBoard handler we set the Title last of all and we are good to go. Graphics In Java - How To Insert Graphics In Java Bluej Hangman Game?? Attempting To Make A Chess Game In Java.